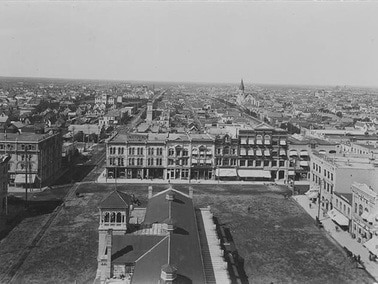 From 1870 to 1919 the "Market Lands" site was an important hub of ​ commerce and trade , home to Winnipeg’s civic market square and building, as well as numerous mercantile businesses. 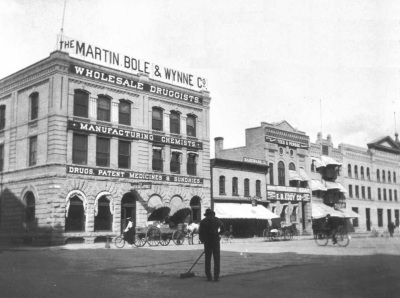 Between 1869 and 1873, Winnipeg's population increased 35 times over, and by 1874 there were over 20 merchants, traders and wholesalers located on Main Street, with a full-scale commercial district developing in the area now known as the Exchange District . 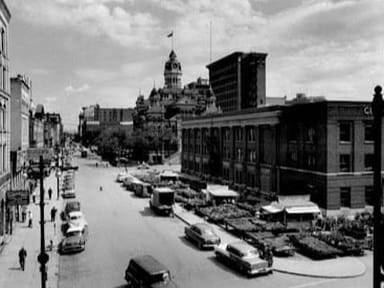 ​The City of Winnipeg was formerly incorporated in 1873 and its first money-raising by-law of the new city included provision for the building of city hall, market-house and police station for $20,000. 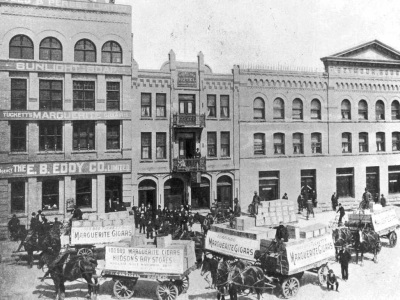 Winnipeg's first public market building (no photo available) was completed on May 1, 1877 adjacent to the first City Hall which opened in 1876. 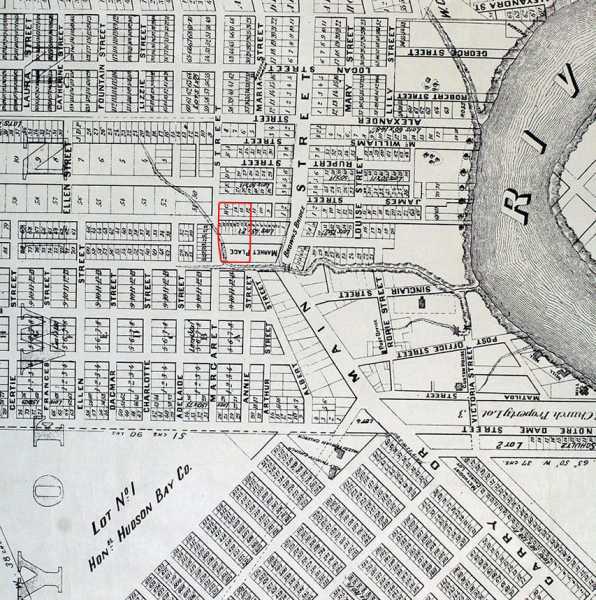 From 1876 to 1919 the public market was such an important civic institution that a committee of City Council managed its affairs: the Market Committee/Court. The Committee set stall rents, policed short weight and unclean premises by stall keepers, and settled claims for spoiled meats. 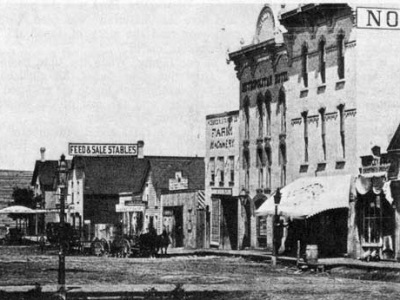 By 1889, due to damage and deterioration of the public market building, much of the Committee’s meeting content of that year dealt with the building of a new market. 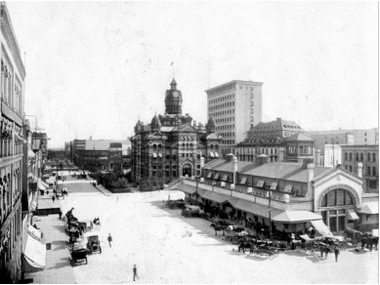 In 1890 Winnipeg's new market building opened, on the site of the current Public Safety Building. There were 24 separate stalls and competition was fierce between local producers to secure a spot, selling meat, fish, and vegetables. 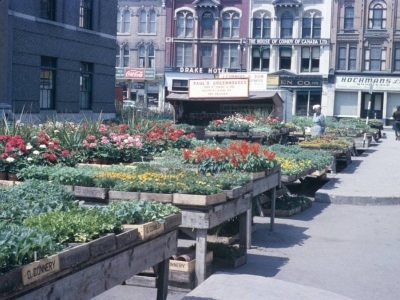 Wagons filled the square with garden plants and other wares. The square also played a vital role for soapbox speakers to spread their word from politics, to religion, to anything anyone felt like talking about. 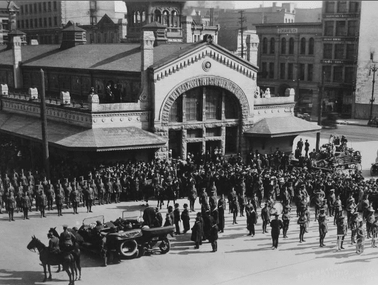 Anti-conscriptionists gathered there during the First World War and trade unionists during the Winnipeg General Strike in 1919. 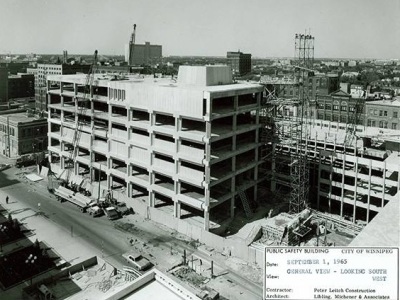 Construction of the new Winnipeg Civic Centre began in 1962, with the City Hall and Adminstration Buidling separated by an open plaza in between, along the Market Street axis. 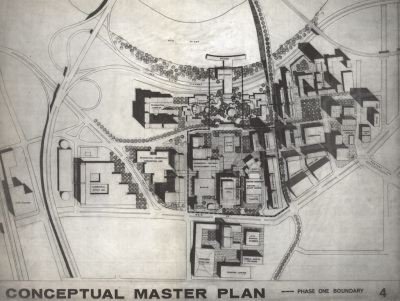 In the original master plan, the site of the Public Safety Building was to house the Greater Winnipeg Metropolitan government. However, by the early 1960's there was growing imperative to replace the City's main police station, located on James Avenue and built in 1908. 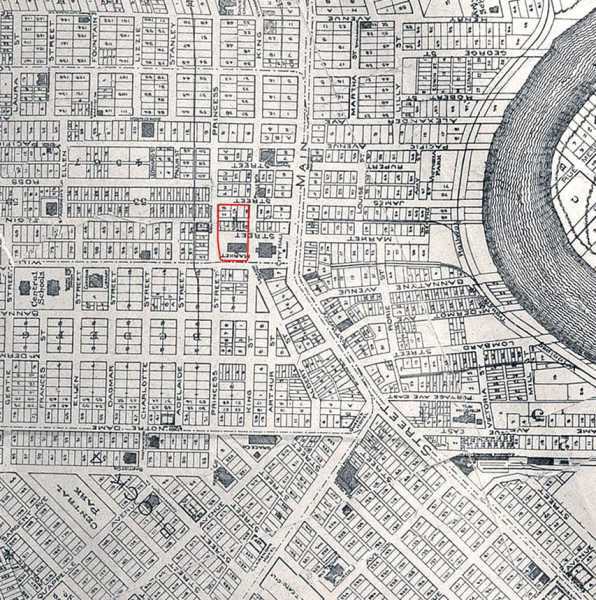 After much debate, in 1964, funding for a new police station was approved on the site of the former Public Market Building. 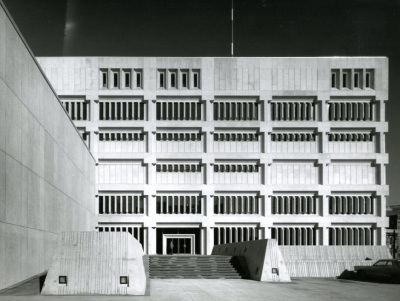 The Public Safety Building and 520-stall Civic Parkade were completed in 1966, completing the Civic Centre complex. 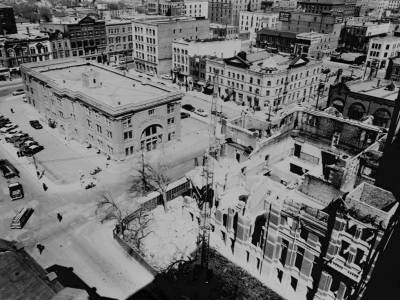 Read a Winnipeg Tribune article about the demolition of the old market building.